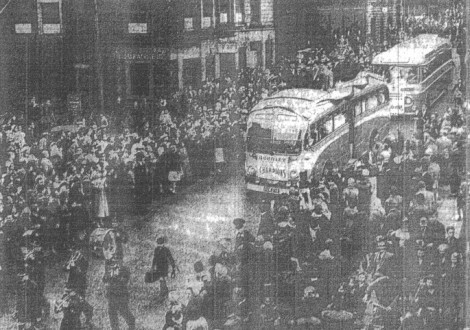 Amid roaring, jubilant cheers, due salute from a vast throng of excited, happy supporters, Burnley's great championship team arrived at the Town Hall to receive a welcome which neither they nor the five or six thousand waiting for them there will ever forget. The team had left Turf Moor via Brunshaw Road, Yorkshire Street, Church Street onto Ormerod Road, Queens Park Road and Queen Victoria Road where they stopped at the Victoria Hospital. Then they visited the General Hospital before going back into town via Colne Road, onto St James Street, West Gate and then Padiham Road up to the George IV. From there they travelled up to Rossendale Road to the Summit before eventually arriving at the Town Hall two hours later. Sitting on top of the first coach was the team which had covered itself in glory, and held proudly aloft for all the folk to see were the Championship Cup and the Lancashire Senior Cup, each with its claret and blue ribbons fluttering gaily in the breeze. Skipper Adamson held the huge trophy high above his head, and as the crowd began to chant 'WE WANT MAC! WE WANT MAC!" he smilingly handed the cup to Jimmy McIlroy. The thousands were delighted. If ever they were silent on the Turf Moor terraces, they made up for it in this moment, in an unbelievable, sustained roar which brought a lump into the throats of those that heard it and tears to the eyes of many. Then, each player, as he alighted from the coach, was given his own ovation, and the Mayor was waiting smilingly on the steps to greet them. The party went into the Town Hall to re-appear a few moments later upon the balcony. The Mayor began to speak into the microphone, but no voice issued from the twin loud speakers below her. The public address system had failed but there was no microphone needed for the crowd to see that the Mayor was giving the players a heartfelt welcome home. The team captain, Jimmy Adamson, stepped forward and of his speech, the snatches which were heard were enough to show his feelings. "We thank you from the bottom of our hearts for this wonderful reception, the climax to a wonderful day." 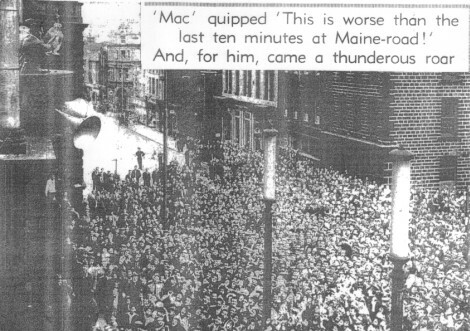 The crowd cheered with all its might, a trumpet blared, the bells rang, then the chant again 'WE WANT MAC! WE WANT MAC!" And suddenly there at the front of the balcony, smiling down at them was Mac their idol, Irish wizard, who has thrilled all the football world with his skill and magic. And for him, the thousands fell silent. His speech was typical of his wit. "I have a very good excuse for saying absolutely nothing tonight - I haven't brought my interpreter with me," he said in his smooth Irish brogue. "I want you to know you are certainly getting your own back on us tonight for all those agonising moments we have given you." He went on, "This is worse than the last ten minutes at Maine Road. We have really enjoyed the wonderful tour of the town." Chairman Mr R. W. Lord made his way onto the balcony and as he re-entered the room behind he said, "Aye. They've touched me tonight. This was something we never expected or hoped for. Of course, if you put on the right kind of football ….!" All the players came out to wonderful receptions before the players returned inside. It was an evening Burnley would remember for a long, long time and one the players would remember for the rest of their lives.